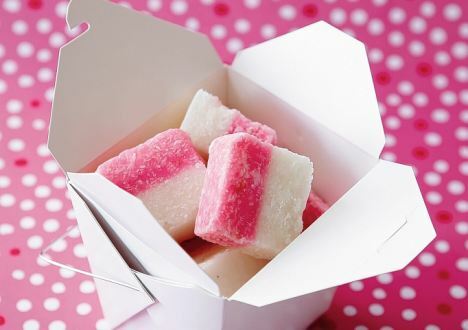 Quick little post from Rhi - I've been making lots of sweeties lately for gifts and for the Super Candy Table at Little M's birthday party and thought I'd post some very quick and easy recipes for anyone scrambling for some last minute gift ideas. Lola's been up in Liverpool the past few days on a festive break with J, and I've been poorly so not had a chance too photograph our own offerings (I remembered this suddenly as Little M skipped off to nursery this morning, my homemade treats in hand!) so I've borrowed some beautiful pics from the net, my candies looked as lovely as this, honest! Slightly different to the pic above, I did my peppermint bark in 2 batches - a white chocolate and a milk chocolate in seperate super thin and tasty layers. 2. Melt your first chocolate (white or milk/dark) - I did 200g at a time on a medium heat in the microwave, though you may prefer to do it double-boiler style. 5. Chill in the fridge till hard and crisp & snap into big slices. Repeat with the other chocolate. A firm favourite in my family, I'll be whipping some more up in the next few days to take along to various festive family functions. 5. Chill overnight (or till set) and cut into big squares. We've also been dipping marshmallows in coloured chocolates & decorating and making up candy jars a la Kate from Kates Irrelevant... Don't forget to check out our guest post for Kate for another gorgeous but purse friendly gift idea.